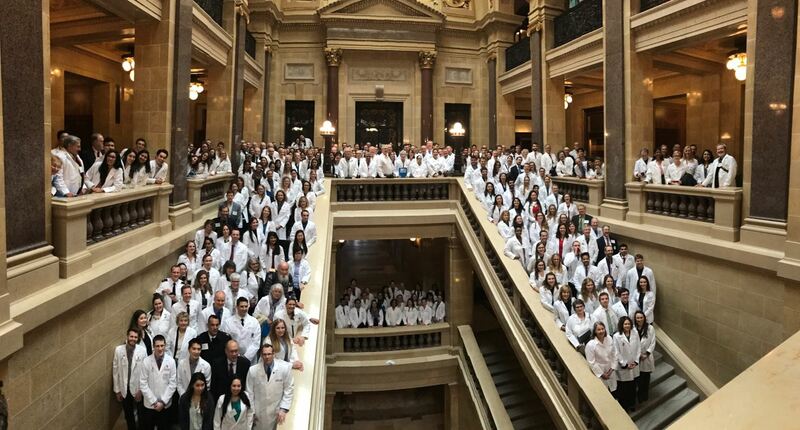 Advocating on behalf of organized medicine is critical to the medical profession, and emergency physicians from across Wisconsin are encouraged to participate in Doctor Day 2019, the annual advocacy event at the Capitol in Madison. 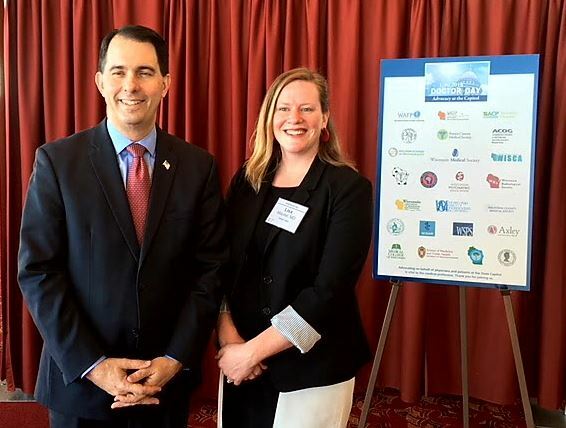 To build off of last year’s tremendous success and participation, a number of physician organizations and specialty societies, along with the Wisconsin Medical Society, are partnering to bring at least 500 physicians to the state Capitol on May 1. Prior to the afternoon meetings, participants will hear from speakers and then will take part in an issue briefing. Lunch will be provided, and the day will conclude with a reception in downtown Madison. The planning committee will schedule your legislative visits and provide information about key topics for discussion. Register today and participate in Doctor Day 2019 on May 1 in Madison. 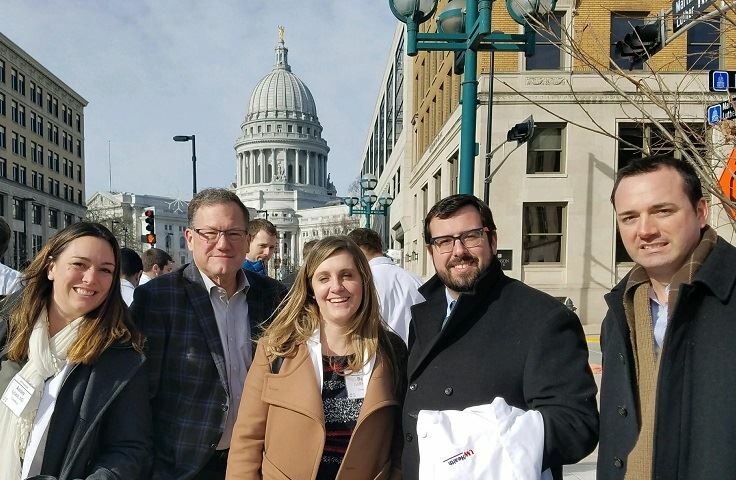 Doctor Day 2018 brought more than 450 physicians and medical students from across the state to Madison to meet with legislators and their staffs on Tuesday. Key issues included a proposed Worker’s Compensation fee schedule, a bill allowing chiropractors to perform comprehensive sports physicals for high school and college athletes, and legislation removing the requirement for certain nurses to work in collaboration with a physician. Now in its fifth year, Doctor Day is a partnership among the Wisconsin Medical Society and other key physician groups and physician-led organizations. The day-long event provides a unique opportunity for physicians from across the state to collaborate and share with policymakers facts and data on timely health care issues. More than 480 physicians and medical students registered for the 4th Annual Doctor Day, which took place in Madison on March 29th. 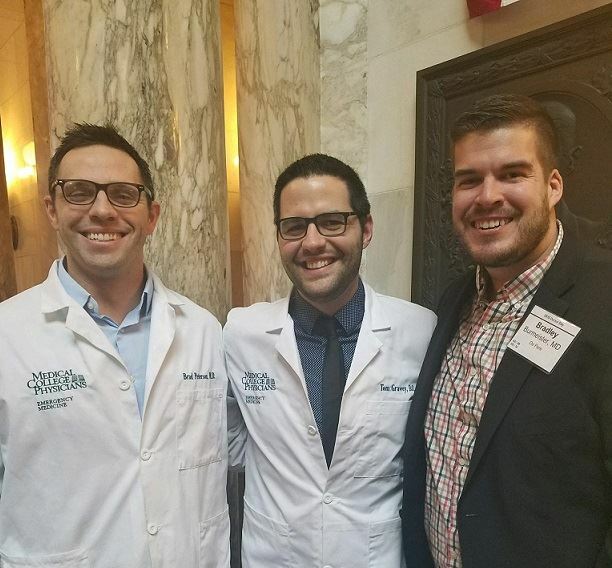 Doctor Day came together in an effort to maximize physician visibility in Wisconsin’s legislative arena, and therefore enhance our collective ability to advocate on healthcare issues. 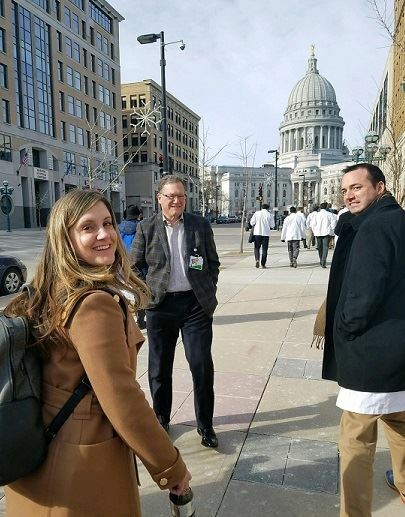 It all began five years ago in a very informal way, drawing 80 physicians to a joint legislative day involving the Wisconsin Medical Society and a handful of specialty societies. Now in its fourth formal iteration, Doctor Day has grown by more than 500%! 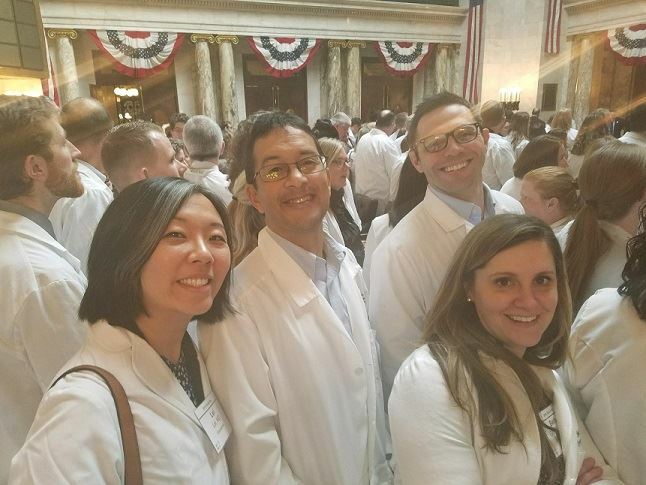 Unique in the nation, the equal-partnership, multi-specialty nature of Doctor Day has quickly become one of the largest Legislative Day events in Wisconsin—and this year, emergency physicians came out in full force. Stay tuned for information about Doctor Day 2018. Due to the surprising growth, we have been forced to look at different venue options to accommodate all. On February 10, 2016, over 300 physicians converged on the Capitol in Madison to let their voices be heard! Physicians and medical students from across the state met with legislators and their staffs during the event. Key issues included those critical to public health (the Heroin, Opiate Prevention and Education [HOPE] legislative agenda), patient safety (concerns over a bill allowing physical therapists to independently order X-rays) and the sanctity of the physician-patient relationship. During the event's morning session at the Monona Terrace Community and Convention Center, attendees participated in a legislative briefing and heard from Lt. Gov. Rebecca Kleefisch and Tim Westlake, MD. 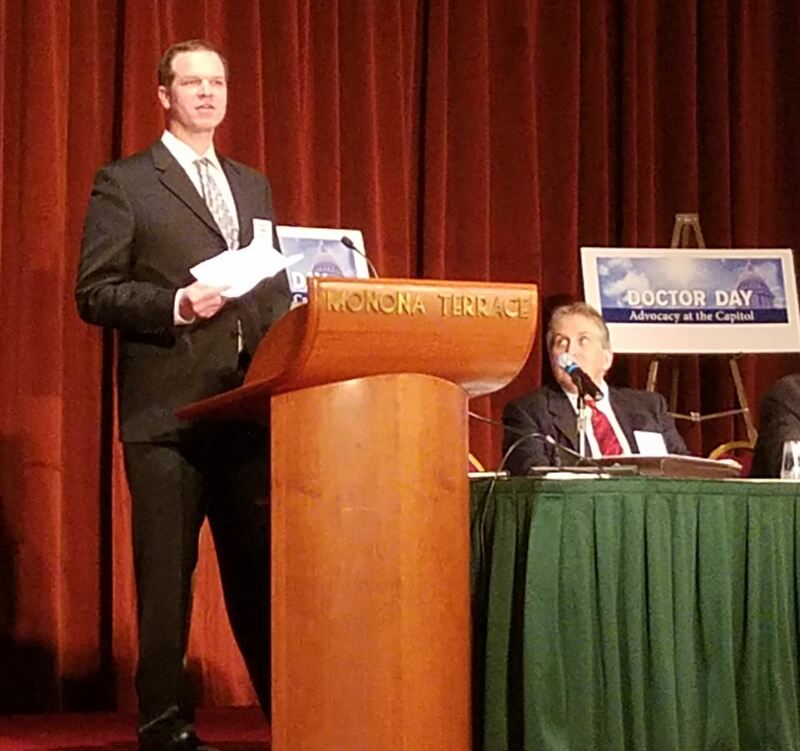 Doctor Day 2015 brought over 250 physicians together to collectively advocate with Wisconsin lawmakers. Governor Scott Walker, Senator Leah Vukmir and Senator Jennifer Shilling addressed the audience (which included more than 20 Psychiatrists) - each speaker in-turn thanking Wisconsin physicians for their work, recognizing the large gathering taking time from a busy profession to come to Madison, and encouraging physicians to continue to build their voices in the political process. The remainder of the morning session included issue briefings by government affairs professionals including WPA lobbyist, Eric Jensen. Issues addressed by Doctor Day attendees during the afternoon's Capitol visits with state legislators included expressing great concern about recent proposals to grant independent practice to Wisconsin's advanced practice nurses, support for legislation to include Wisconsin in the growing number of states joining the Interstate Licensing Compact for physicians, and expressing strong opposition to physician fee-schedule proposals being forwarded in relation to worker's compensation cases. 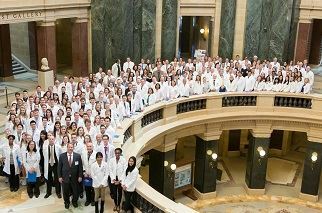 In February 2014, the first-ever Doctor Day was held in Madison, marking a cooperative effort that brought together nearly 200 physicians representing a dozen physician organizations to jointly lobby the Wisconsin Legislature. Designed as partnership among specialty medical societies, the Wisconsin Medical Society and other physician organizations, the day exceeded organizers' expectations and demonstrated the impact physicians can have working together.